The trigger fish is a tropical reef fish that is among the hardiest of species. It does well and adapts quickly to aquarium life. This fish can live successfully in a variety of tanks. However, tall or narrow tanks should not be used. An adequately sized aquarium will depend on the species of trigger fish that is going to inhabit it. It is also important to keep in mind the other tank mates that may be present. A larger, roomier tank will allow for a happier, community setting as certain types of trigger fish may become aggressive, especially in small spaces. Triggers can live with other fish, but room mates should be chosen carefully and owners should follow any stock orders given by the supplier. Odd shaped tanks are also not conducive to a happy life for these tropical reef fish. Feeding these fish can be super easy. In their natural habitat, triggers will browse among the reef and coral for snails, crabs and other small fish. In captivity they will accept a vast array of fish food, whether it is fresh, frozen or previously prepared. In fact, trigger keepers can even shop at the local seafood counter at the grocery store. Bite size pieces of fresh fish, squid, crab and more can be hand fed to the fish. Supplementing periodically with vitamins is key to ensuring that the trigger maintains a healthy diet. While breeding is not an extremely common practice among captive trigger fish, some species have been known to reproduce in very large tanks. It is possible but not guaranteed. Females will create a nest in the sand and lay eggs. These eggs are not free floating so any shaped aquarium can successfully protect and promote the birth of new fish. 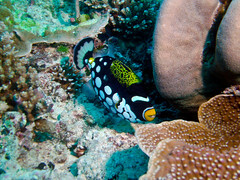 The good news is that this type of tropical reef fish is by far one of the most hardy species. These aquatic animals are extremely resistant to disease. However, they can occasionally be affected by saltwater ick. But with just a bit of extra care and attention, this can be cleared up quite successfully with no detrimental effects.